Jack Phelan Chrysler Dodge Jeep Ram of Countryside is a family owned dealership. We have been in business for almost 50 years, and our professionals continue to lead a strong and proud dealership into the future. This Dodge dealer near Oak Lawn, Illinois has numerous new Dodge vehicles for sale. 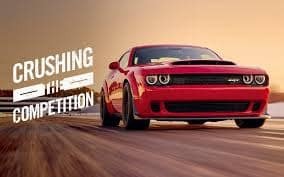 Selections include the Dodge Challenger, Charger, Journey, Grand Caravan, and the Dodge Durango. In addition, we have lots of other new models in stock. These include Ram pickups and vans, such as the Ram 2500 and Ram ProMaster, Chrysler vehicles for sale, and other choices like Jeeps. Customers can inquire about our below MSRP prices today. Moreover, used vehicles and certified used models are available. Being a Dodge dealer near Oak Lawn, Illinois is great news. Jack Phelan Chrysler Dodge Jeep Ram of Countryside works with the growing population of Oak Lawn, as well as other cities and town locations. If you are a commercial driver seeking an outstanding commercial vehicle for sale, then simply contact us. We have commercial brochures available that give you the lowdown on top work vehicle selections. There is also on the job allowance benefits that you can inquire about for your vehicle. Again, we have below normal MSRP rates in place to satisfy your budget needs. Please speak to a Jack Phelan professional today regarding our prices and the different types of vehicles for sale. Parts specials, service specials, and Mopar specials are all available here at Jack Phelan Chrysler Dodge Jeep Ram of Countryside. You can talk to Jack by leaving your preferred comment method in the proper section. Just ask questions or leave comments for a professional to respond to. This Dodge dealer near Oak Lawn, Illinois can email you, call you, or even leave a text message for you. Our strong line of communication reflects our customer commitment on a daily basis. We have flexible hours to accommodate your work schedule. Please take the time to meet our staff and let us know how we are performing through a customer review. Customers in need of quick service can use our express lane service section. We can give you a timely oil change or a tune-up on your make and model. Jack Phelan Chrysler Dodge Jeep Ram of Countryside also has financing offers. Just talk to us about your specific finance needs, and we will set forth a plan to meet your goal. Financing offers and specials can vary based on your credit score, but please be aware that this Dodge dealer near Oak Lawn, Illinois always does everything possible to get you the best loan from a top auto lender, so that you can ride in the vehicle you desire each day. Drivers will want to contact us to get to know more about our dealership and the types of services that we provide. Jack Phelan Chrysler Dodge Jeep Ram of Countryside is ready to tell you more about this Dodge dealer near Oak Lawn, Illinois today.